Guitars come in all shapes and sizes these days and some people are really pushing the art form. 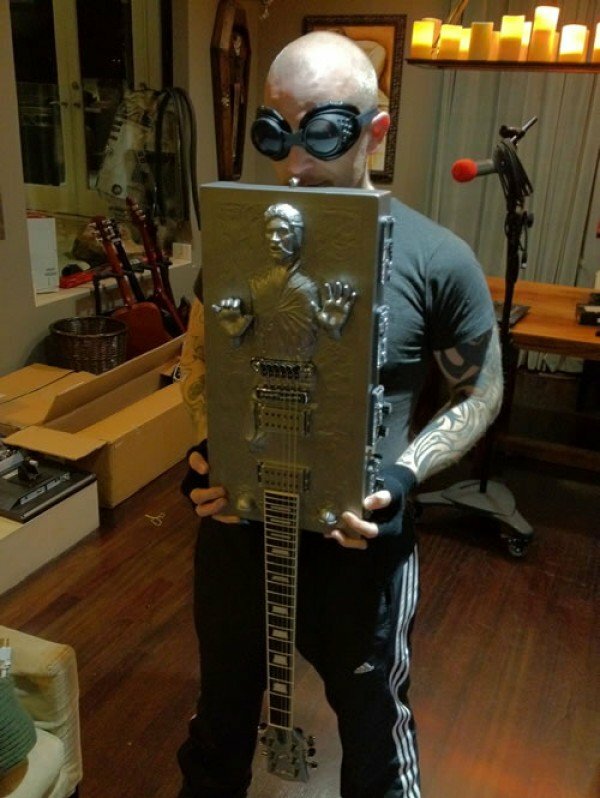 This beautiful homage to that scruffy looking nerf herder’s brief (if you consider the 3 years between Empire and Jedi brief) stint in carbonite comes from Travis Stevens, who built this frozen Han Solo guitar for Evanescence co-founder Ben Moody. The design is pretty awesome even if the player will be more or less strumming Han’s groin area. Still, as custom guitars go, this is one of the cooler ones out there. But of course I love the original Star Wars trilogy more than most other things. Travis also built the Millenium Falcon guitar that we featured a while back. The man sure knows how to make some cool Star Wars themed musical instruments. I can’t wait to see what he does next. Somebody already beat him to the punch with GuitaR2-D2, though.